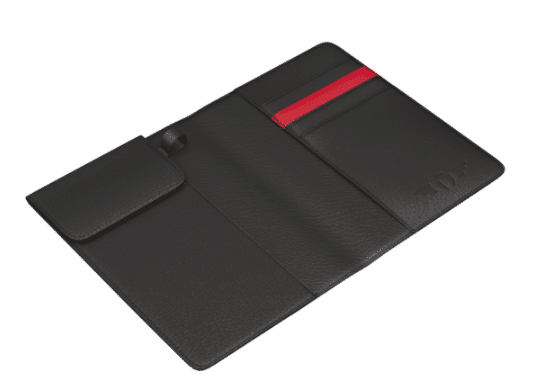 The Talonport Leather Passport Holder alleviates travel hassle with their high-quality product. Ready for a not-so-frilly passport holder that’s actually useful? 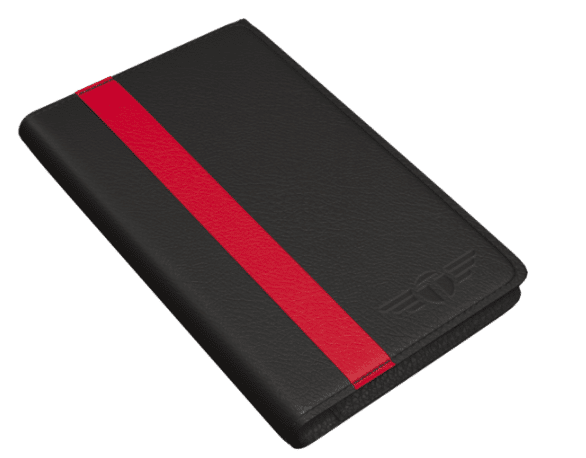 The Talonport Leather Passport Holder offers quality and design that will actually improve your travel process. Of course, you don’t want your passport holder to become an extra nuisance since anything superfluous makes travel more difficult. However, this leather passport holder does its job well. That’s all thanks to its superb construction, great design, and plentiful organizational pockets. Perhaps you’re wary of the expense, but the Talonport Leather Passport Holder lives up to its expectations. To begin, this leather passport holder is true leather. That means it is soft and supple, as well as strong. Because of this quality material, Talonport can guarantee that it will last for you. Additionally, your Talonport leather passport holder comes with a lifetime craftsmanship replacement guarantee. That means if for any reason, your passport holder needs to be fixed, you can send it into Talonport for a free repair or replacement. Where cheaper passport holders might leave rooms for gaps, or fit too tightly, the leather material and precision handcrafting ensure a perfectly snug fit for your passport. Finally, this quality leather passport comes delivered to you in a nice retail box which makes it a lovely gift. Between the look and feel, it’s clear that this passport holder boasts true quality. This leather passport holder has been created by people who know travel. Rather than create a superfluous accessory, Talonport has sought to make a product that will alleviate your travel hassles. Therefore, the Talonport passport holder offers a bit more than a “sleeve” for your passport. You’ll find a document wing that folds out, to hold your boarding pass, currency, bag tags, or notes. The passport pocket is easily accessible. Lastly, you’ll find four card slots which can hold up to four credit cards. Therefore, this leather passport holder can become your main wallet when you travel, if you so desire. Because the document wing folds out (and back in), your slips of paper will be held in place. 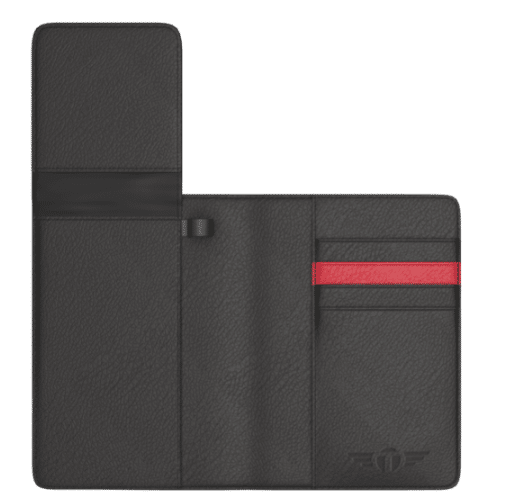 Despite the many things that this leather passport holder can keep together, it still maintains a slim profile. Additionally, the authentic leather gives it the appearance of true luxury. The side stitching adds just a bit of texture, without being an unsightly essential. Lastly, the red stripe gives it a subtle flair against the dark background. The not-so gender specific design makes it great for everyone. Other travelers also love the Talonport Leather Passport Holder. Despite any wariness about the relatively high price, most customers are totally confident that the passport holder was a good purchase. Many suggest buying it for a friend who also travels frequently. This passport holder began on Kickstarter and made some great progress. In fact, it was fully funded in less than twenty-four hours. Its success on Kickstarter meant that many customers believed in the necessity of a quality travel passport. This allowed it to become available on Amazon, as it is now. Overall, customers haven’t been let down by the Talonport Leather Passport Holder. In fact, Talonport's website claims this product to be the world's best passport holder. 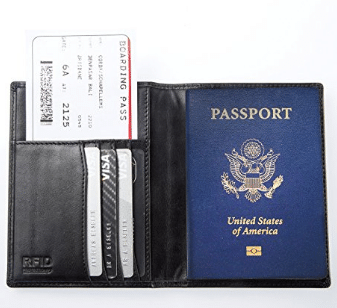 Talonport promises a "first class experience" with their leather passport holder wallet. If you’re looking for a simpler passport cover, rather than the leather passport holder, considering the one by Inspiring Adventures. It’s from cow leather, so it’s soft to the touch. Inside, you’ll find seven pockets. Five of these pockets work vertically, lined up on the left side of the fold-over passport cover. Therefore, your passport fits inside, as well as any other credit cards or documentation you might need when traveling. In fact, this passport holder can even fit two passports. It’s a great size for holding your passport, yet still not taking up that precious space in your purse or carry-on. Inspiring Adventures offers a lifetime guarantee on their product. Plus, this London-based company promises to plant a tree for every purchase made: how cool! Lastly, it’s RFID-blocking to keep your information safe. This leather passport is a nice option for a slimmer passport cover. The Zero Grid Money Belt earns itself many stars, and travelers especially love two things in particular. First, the appearance of the belt means that wearing it won’t totally impede your style. It looks good on both men and women. Secondly, travelers love the amount of cash they can carry in this belt. Of course, it’s a belt and therefore narrow, so you can't expect to fit your extra sweater in here, too. However, the inside zipper stretches around your waist, and that means you can fold and fit many money bills or other papers in here. 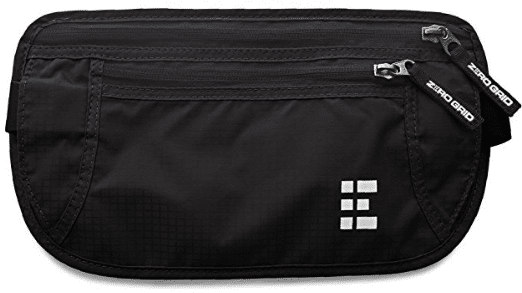 This money belt includes some great features that help to alleviate your travel hassle. The clasp works well, so you won’t have to fumble with it clumsily. You can adjust the waistband without the limitation of the spacing of holes like a regular belt. Additionally, the buckle is plastic, which means you won’t have to take it off through the security screening. The Lucky Oak Passport cover stands out for a certain reason. This 100% genuine leather passport holder features a unique band which wraps around to keep contents safe and compact. Plus, you can choose from a fun variety of patterns and colors that will help this travel accessory to “accessorize” your outfit. Options include “brown vintage,” “mustard vintage,” and “red snake.” The presentation of this passport cover is splendid, too. It comes in a pouch with string and therefore makes a great gift for your travel-loving friends. Lucky Oak includes two clear passport covers to keep your passport from fraying. 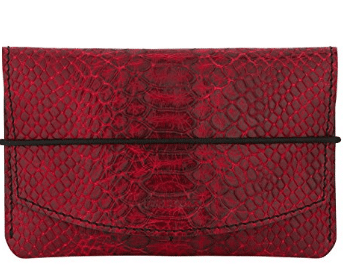 You can fit two passports in here, as well as various credit cards and slips of paper. The flap opens from the top, and the elastic strap pulls across the front to keep everything snug. We appreciate this open-from-the top design, the colors and patterns, and the wrap-around band, which all make this passport holder unique. The Talonport Leather Passport Holder is a quality travel accessory meant to keep your journey hassle-free. The quality of the product is showcased at first glance. It’s unmistakably genuine leather, and the feel is soft and supple. Your passport fits just perfectly, almost like it was handcrafted. Talonport has thought of everything, so your bag tags and pen for filling out customs forms even get their own spot. The promise from Talonport (that you’ll be pleased with their product) exemplifies their pride in this leather passport holder. Like many others, once you try this leather passport holder for yourself, you’ll likely want to purchase more as gifts for your friends and family. The Talonport leather passport holder is a welcome accessory when traveling since it serves an important role in keeping valuable documents together. 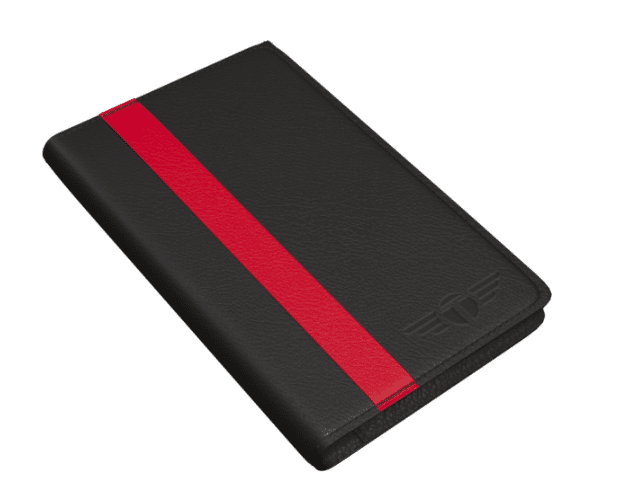 The Talonport Leather Passport Holder offers quality and design that will actually improve your travel process.